A few weeks ago my son, Elliot, won a goldfish. Actually, he got two. Grandma was concerned that his living prize might not make it through the day and so she made sure that he received another. Elliot named his new pets Fred and Jingo, and was very excited about the new additions to our family. Little Fred seemed a bit lethargic as Elliot packed his overnight bag and headed to granny’s. “He’s laying down,” Elliot explained to grandpa. Shortly thereafter Fred passed away and papa sent his limp, orange body back to the river. And so it was that little Fred gave Elliot his first real experience of mortality. When Elliot returned to find his fish missing, he wasn’t surprised to hear that Fred had died. He asked what we did with the body and he cried. He cried that he missed Fred. He cried that Jingo missed Fred. He cried and he cried that he never got a chance to say goodbye. 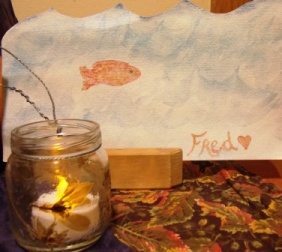 “Perhaps we should make a painting of Fred,” I offered, “and put it on the ofrenda at our lantern festival.” This calmed Elliot a bit and we snuggled and talked about Fred. We only knew the little creature for a day, but we imagined what his life was like before the fish race and the plastic bag and the bumpy ride and little glass bowl. From time to time, Elliot still gets a bit melancholy and says he misses Fred. Like many children, Elliot began to ask about death when he was four or so. Whenever addressing children’s questions I strive to give simple, open, honest, age-appropriate answers. So, I explained that bodies eventually stop working, but our spirits continue on in one way or another. Often, the spirit chooses a new body. I decided to save the deep philosophical discussion and scientific analysis of the Mystery of Life and Death for another day, many years from now. He quietly accepted my brief answer and pondered. 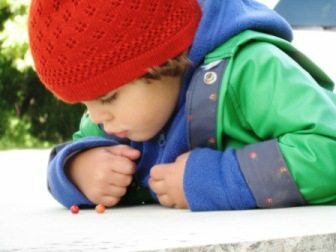 Many very young children seem to accept death as a matter of fact and watch with curiosity and concern as the adults in their lives mourn loved ones who have passed away. They imitate the adult’s grief, talk about the departed or work through their experience through their play. There are many spiritual, religious and cultural rituals to guide families through the loss of a loved one. Even those who have no particular religious practices can benefit from healing stories, rituals and memorials. Cultures throughout the world have festivals of remembrance this time of year. All Saints Day, Dziady and Dia de Los Muertos honor those who have passed. 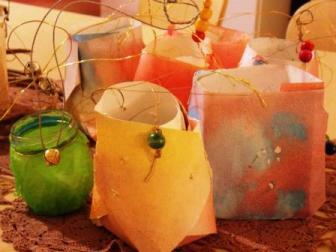 At the Milwaukee LifeWays, we have incorporated this time of remembrance into our festival of light, the lantern walk. Our nature table becomes a sort of ofrenda, a Tree of Stars, decorated with silks, lanterns and pictures of loved ones who have passed and were lights in our lives. Families bring pictures of relatives, pets, namesakes, family friends, anyone who has significance to the family or child. We also encourage families to bring favorite recipes that have passed down from a relative that has passed to share at the pot luck. On the day of the lantern walk children play and sing, pausing to admire their lanterns and the ofrenda from time to time. They help chop vegetables for stone soup and eagerly anticipate the warm cider, fresh breads and desserts. As the sun starts to set in the sky, families come together bearing food to share and warm caps to wear. The festival begins with a few words for the parents. We listen to a story, sing together under the stars and quietly stroll through the woods as home made lanterns light up little faces. Our walk closes with song and blessings and then we head indoors for warm soup and cider and time together. Jaimmie Stugard has been a caregiver at the Milwaukee LifeWays for nearly ten years. 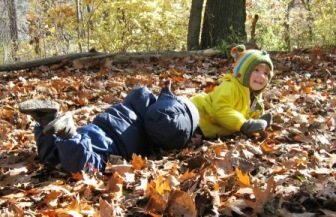 She is grateful that she is able to bring her own little ones with her to LifeWays each day. She is also the music teacher in the Wisconsin LifeWays Training.